“Top! Sigh! Mommyyyyy!” Clearly, this was important. I looked around. And saw the stop sign we’d rolled up to moments before. As we continued our drive to school, I tried to think about where he could’ve picked up on what a stop sign was. It wasn’t in any of his books, and he doesn’t have one as part of train or car play sets. Then I realized. It was Daniel. We love “Daniel Tiger’s Neighborhood” in our house. As we started to allow our little man to begin watching TV, my wife and I both immediately seized on it as one of the few toddler shows that was not only acceptable, but really great quality. As educators, we’re picky about stuff like that. We fostered a love of Daniel Tiger in our toddler that quickly became genuine. 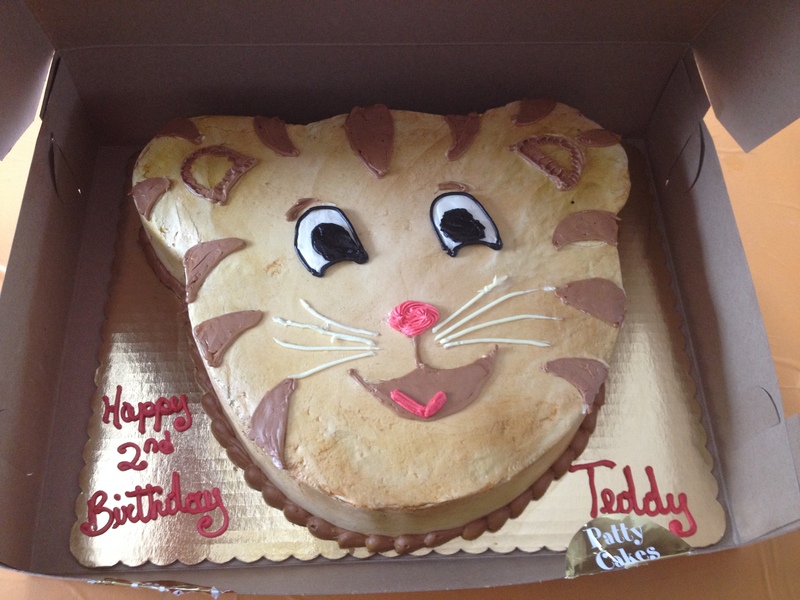 His 2nd birthday was Daniel Tiger themed, complete with a Daniel-shaped cake that was the hit of the day. Which brings us to that morning at the stop sign. I realized that the night before, our nightly evening episode of Daniel had been the safety episode, including a lesson about stop signs, and a song about how to stay safe. (“Stop, and listen to stay safe!” Or, as sung by a toddler, “Stop, listen, stay safe!”) Little man was making a text-to-self connection to his favorite show. Teacher-mommy’s heart swelled. I recommend Daniel Tiger to other parents all the time. “If you haven’t watched it yet, you need to,” I tell them, over and over. My wife even raved about it to the assistant director of our daycare. There is so much to love about this show, but here are the things that, to me, make it far and away the best thing for kids on TV. The nostalgia factor. The show is produced by The Fred Rogers Company, the legacy of the beloved Mr. Rogers of your childhood. This is what first turned us onto the show as parents. Daniel is the son of Daniel Striped Tiger from “Mr. Rogers’ Neighborhood,” (which I watched daily as a kid) and the other characters are also related to the familiar puppets from the show. We love being able to pass on something that was so significant in our own childhoods to our son. A great educational approach. True to its roots, “Daniel Tiger’s Neighborhood” focuses on teaching kids more than ABC’s and 123’s. As a summary from the show’s official website states, it “tells its engaging stories about the life of a preschooler using musical strategies grounded in Fred Rogers’ landmark social-emotional curriculum.” Watching it, our son is learning important skills like how cope with anger, disappointment, excitement, and other strong emotions that can often bewilder toddlers, as well as social skills like sharing and waiting and finding a way to play well with others. The songs! Did I mention the songs? They are great. Each episode features a catchy jingle to help kids remember the social-emotional skill focused on in that episode. Around the house, we are always finding ourselves singing the jingles to remind our own toddler what to do, “Clean up, pick up, put away! Clean up, every day!” at clean up time, or “We gotta try new food ’cause it might taste goo–ood!” at dinner time. It really works, and has totally decreased our frustration level with typical toddler behavior, as well. The apps. The Fred Rogers Company has produced 3 different apps that accompany the show, and they are fantastic. My personal favorite is Daniel Tiger’s Night and Day, which is great for helping establish morning and bedtime routines. But all three apps are great, and one of the many things I love about them is that they have so much stuff to keep kids engaged! Daniel Tiger is fixture in our house, and I’m totally fine with him staying that way for a good long time. There are a lot of really pointless or annoying kids’ shows out there, but by making wise choices (and still limiting TV time to ensure kids are playing and reading as well) I think that we as parents are helping our toddler develop some great–and very important–life skills.